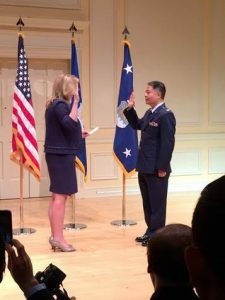 WASHINGTON, D.C. (June 15, 2016) — In a ceremony conducted by Secretary of the Air Force Deborah Lee James, U.S. Rep. Ted Lieu (CA-33) was promoted from Lieutenant Colonel to Colonel in the United States Air Force Reserve. Lieu, who’s district includes Los Angeles County, serves on the House Committees on the Budget and Oversight & Government Reform. He is also the Democratic Freshman Class President and a Colonel in the Air Force Reserves. Lieu served four years active duty in the Air Force and currently serves in the Air Force Reserves, for a total of twenty years of service. He was joined by family, friends and honored guests, including House Democratic Leader Nancy Pelosi, House Democratic Whip Steny Hoyer and Veterans Affairs Secretary Robert McDonald. Congressmembers Seth Mouton, Ruben Gallego and Steve Russell assisted in pinning on the rank of Colonel at today’s promotion ceremony. Lieu’s promotion to Colonel is a rare event. Of the 660,000 men and women serving in the United States Air Force on active duty, reserves, and guard, less than four thousand have attained the rank of Colonel. During his Air Force career, Mr. Lieu served on active duty in Operation Pacific Haven. He has also received numerous medals for his military service, including the Air Force Humanitarian Service Medal and multiple Meritorious Service Medals. “As the son of immigrant parents who were able to achieve the American dream, I joined the Air Force on active duty and decided to continue to serve in the Reserves to give back to America – an exceptional country of boundless opportunity that has given so much to my family. I am deeply humbled to be promoted to Colonel. Thank you to Secretary of the Air Force James, Leader Pelosi, Whip Hoyer, Veterans Affairs Secretary McDonald, and Representatives Moulton, Russell and Gallego for sharing this special moment with me today.